Representin' in the City with some Expert Crane Work!! Representin’ in the City with some Expert Crane Work!! “Dang-it Bobby! ; how do ya operate that crane so well?” Some beautiful spring weather and our southern skyline made for a great day of crane work recently. Our expert crane operator, Bobby, and one of our best climbers, Lin, work extremely well together to handle the removal of large, dangerous trees in our area. This Charlotte tree was in a rapid state of decline, probably because of the concrete and asphalt above the root zone, preventing the roots from receiving adequate amounts of oxygen. The crane sends up a man to securely hook heavy-duty straps to large branches or leaders. These straps are then attached to our crane and Lin cuts sections of the tree from below. Once Lin cuts through the large sections or leaders, the crane lifts them and places them in a designated area and then the process is repeated. We often log these large trees to save unnecessary wear and tear on our chippers. 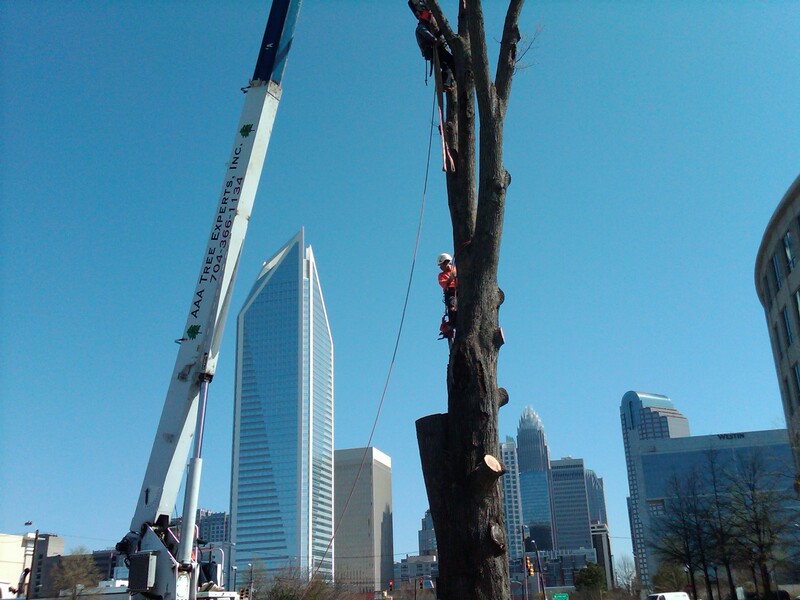 This tree removal was for the city, but AAA Tree Experts handles commercial and residential pruning, removals, and tree health care as well. Please go to our website at aaatrees.net or call us at 704-366-1134 for more information.